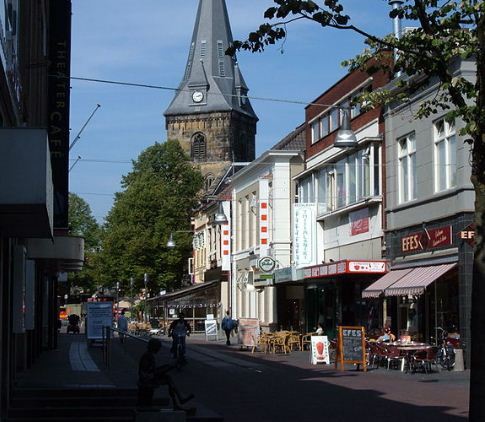 Enschede is the largest city in the Twente region and is located in the Overijssel province of the Netherlands. This green city is surrounded by nature and is an excellent place for cycling, walking or horseback riding. After a large fireworks disaster, the city was left in disrepair and is still being reconstructed to this day. Although Enschede has a long history, its roots are still shrouded in mystery. Early history of Enschede is still unknown. However, it appears that a settlement did exist near the Old Marketplace during medieval times. At the time, the settlement went by the name of Anescede or Enscede and included a marketplace, church and a fortified house. The town was finally given city rights in 1300, but these rights were not confirmed until 1325 by Bishop Jan III van Diest. Although the city had the opportunity to build a stone wall, the project was too expensive. Instead, a series of ditches, hedges and palisades were built. This is reflected in the names of the city streets, which include Zuiderhagen (South Hedge) and Noorderhagen (North Hedge). As with most medieval cities, Enschede was largely at risk for fires because homes were built of wood. A series of fires occurred in 1517, 1750 and in 1862, which caused large amounts of damage to the town. It is for this reason that the people of Enschede have earned the nickname Brandstichters, or arsonists. After the last series of fires in 1862, the town saw tremendous growth as it soon became a large producer of textiles. Cotton was its original industry, but they soon branched off to produce bombazijn, which is a mixture of cotton and linen. Of course, with an increase in industry, a boom in the population was also seen. During World War II, Enschede was frequently bombed by allied troops who were aiming for the German command center. In some cases, the allied troops mistook the city for a German town. However, the city was quite successful at saving many of the Jews that went into hiding. Out of 1300, 500 were saved. During the 1970s, the city ceased their production of textiles. Competition from the Far East forced many factories to shut down and consequently had a negative effect on the town’s population. Soon after, the city became one of the poorest in the Netherlands and, essentially, went bankrupt. With the help of the government, the city was re-built. The center of town became a car-free zone. Despite the firework disaster in 2000, the city has managed to rise from the ashes once more and remain a thriving town. Getting to and around the beautiful Dutch city of Enschede is very easy due to the well run and integrated system of public transport services and the excellent road network. There is no local airport for Enschede and probably the easiest way to get there by air, is to fly into Schipool airport, Amsterdam and conclude your journey by either rail or, if you would like more flexibility, by road after hiring a car from one of the many car hire firms at the airport. If you are travelling to Enschede by train you will find that there is an efficient and well run network of trains running to the city from local, national and international destinations. The train from Amsterdam is a frequent and direct service which will take around 2 hrs to arrive. There is also a good service from Dortmund and Munster. There is a connecting train via Hengelo to Berlin for those that are travelling from Germany which takes approximately 5 hrs from station to station. There are also fast trains from Rotterdam and The Hague. To get up to date information on fares and journey times, you should call the national train helpline on, +31(0)900 9296. There is a good bus network, to and around the city. The local bus station is right by the central train station in the middle of the town. The local buses are run by the Syntus company, who also run the long distance services, from Denekamp, Hengelo, Oldezaal and Overdinkel. To get information on both the local and long distance buses, you call the information line on, +31(0)900 9292. There is a good efficient taxi service in Enschede. The taxis are clean, safe and well run. The taxis can be found at taxi ranks, such as at the train station, flagged down in the street, or booked by phone. The numbers for 2 local services are, Taxi Hotax 053 478 4789 and Di taxi at 053 461 5060. Enschede is reached by car via the A35 and there is a good, (5 min journey) park and ride system as you drive towards the city. There is also a large, 2,000 space car park under the main square, but traffic, to and from the centre may be heavy. There are no cars allowed in the middle of the city. Probably the easiest way to get around the city centre is to either walk or hire a bike. there are several places where you can hire a bike and as elsewhere in Holland there is a good system of cycle routes. Enschede is a medium sized city in the eastern province of Twente. In former times Enschede was a major centre of the textile industry, but now it is a university city that also has business, scientific and technology areas. In the year 2000 there was a large explosion at a fireworks warehouse near to the middle of the city. As well as causing much loss of life, it also destroyed a small area of the town which has since been rebuilt with some interesting architect designed buildings. In 2003 Enschede was named the greenest city in Holland. The Grote Kerk is not only the oldest church in Enschede, it is also the oldest building. Founded in 1200 it has been enlarged and altered over the years and, as such, makes for a fascinating trip for anyone interested in medieval architecture. For those with a more modern taste in buildings, the Roombeek is the area destroyed by the fire works explosion. It has since been rebuilt with the help of various well known and talented architects. It is a very interesting place that also has a lot of green spaces. Museum Twentse Well at, Het Rozendaal 11 is a modern museum which is also in the Roombeek. It has many interesting exhibitions on the peoples and the way they lived in historical and ancient times. Although the museum is very interesting, the exhibits are only in Dutch and German. Enschede has some great places to shop. Indeed it is thought by many to be the best shopping in the east of the Netherlands. There is a weekly market which sells a wide and interesting array of goods and product. As well as the many locals that visit the market, there are also many visitors from the nearby border with Germany. HJ van Heekplein has a good selection of both large and small shops as well as some major retailers. If you are looking for something a bit more off beat some of the smaller back streets contain many interesting artisan stores and boutiques. De Oude Markt is a beautiful terrace where there are many good cafes and restaurants. At Walstraat 15-17 is Appeltjes van Oranje, a great and friendly Dutch restaurant serving local food in an atmosphere that is more like a dining room than a formal eaterie. Enschede is a great little city that can offer something for everyone, whether you are going for a holiday, or just visiting on a day trip while in Germany.